RapReviews.com Feature for June 20, 2017 - Faith Evans & The Notorious B.I.G. - "The King & I"
After "Duets in 2005 and "Greatest Hits" in 2007, it seemed like we were finally done with posthumous releases featuring the late great Christopher Wallace better known as The Notorious B.I.G. slash Biggie Smalls. Not so. We still had the "Notorious" soundtrack coming in 2009. That's fair. If you're going to make a movie about the life and times of Mr. Wallace an album to go with it makes sense, and as I noted at the time it was in some respects "a better 'Greatest Hits' album than the actual one" released two years earlier. You could cynically call it a cash grab if you liked, but it was no more or less of one than anything else released since his death on March 9th, 1997. 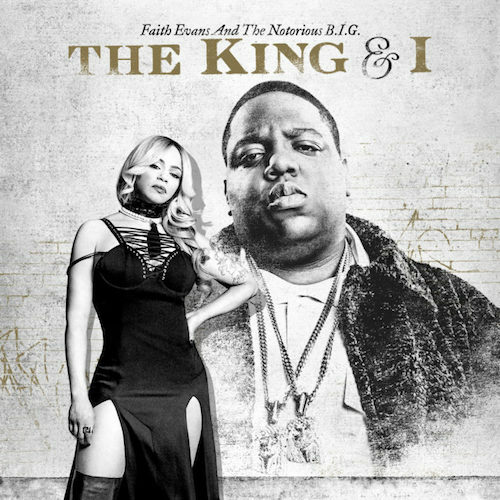 A little over 20 years after that date was burned into the memory of hip-hop heads (and made unforgettable by the countless rappers to reference it), Faith Evans and Rhino released "The King & I" on May 19th. While many in hip-hop accepted and understood the need for a soundtrack to go with a Biggie biopic, the reaction to this Evans album has been much more muted. The album did crack the Billboard Top 200 its first week out, but a paltry 9,000 units sold didn't exactly light the world on fire. There wasn't exactly a remarkable amount of promotion leading up to what could arguably be an "event" album given the historical timing, and although Evans and Wallace were estranged at the time of his passing, they were not in any way divorced. In fact if you saw the aforementioned biopic you saw their son together - one Christopher Jordan Wallace Jr. - portraying his father at a young age. To be honest watching the film it was kind of eerie how much like his "Big Poppa" the young man was. If ANYBODY in the music industry is entitled to make a posthumous Biggie album it's probably "Fay." At some point though the cynicism rears its ugly head to ask one simple question though: "Why?" It's not as though Evans released tributes to her late husband on the 1st, 5th, 10th or 15th anniversary of his passing. At this point we have to keep it real and although it might come across as rude (no disrespect to her is intended) the facts are such: Evans has not had an album certified gold in over a decade since "The First Lady" back in 2005, which was her first release since splitting from her deceased husband's record label. Obviously public interested peaked at this point to see if Evans could succeed without the Sean Combs machine behind her, and on the strength of singles like "Again" and "Mesmerized" the album did quite well - selling 150,000 copies the first week alone. 150,000 versus 9,000. It's hard to ignore the stark difference between those two numbers. It seems the public lost interest in Evans after this release, and it's partially her own fault by taking a five year hiatus from the music industry. A turbulent period in the 2010's saw her get arrested for a drunk driving incident and get divorced from her second husband. Therefore the answer to the question "Why?" seems to be "Because how else will anybody be interested in Faith Evans at this point?" Again that's potentially rude, but so is the lack of interest in the album following its May 19th release. Ironically the tepid reception was what actually piqued my interest in "The King & I." Were people being too hard on Faith Evans? Was there actually something worthwhile in this quite large 72+ minute album that people weren't giving a fair chance? After all the one thing you can't take away from Evans is that she's a remarkable singer. She may not set the records Mariah Carey did a generation ago or that Beyonce does today, but in talent level she at least deserves the comparison AND does have the gold and platinum plaques to back it up even if they're getting a little dusty these days. Though her marriage to Biggie was a rocky one, there's no doubt that they felt genuine affection for one another, and the inserts between songs showcase the playful side of that relationship. We even get to hear Evans re-enact a moment from their relationship together with actor Jamal Woolard, from that Biggie biopic we keep discussing, where Evans decided to prove her hip-hop credentials to her soon-to-be husband. Those moments occasionally give "The King & I" a charm that's worth listening to, although it can at times be heartwrenching to hear from his mother Voletta Wallace on this CD. To be sure though these segments have an ulterior motive whether accidental or intentional, which is to give credibility to remakes like "Ten Wife Commandments." I don't think I needed to hear anybody revise the DJ Premier original, an all time hip-hop classic and a signature record from Biggie's catalog, and in this case I'll direct any disrespect toward producer Sheard II for having the chutzpah to think this was a good idea. It was NOT. It was ill-advised at best and it's irritating at the worst, and not because Faith Evans can't sing - it's just a song that nobody ever needed to sing over. Trying to scratch Biggie's lines doesn't help, especially (again) when your point of comparison is Primo. OUCH. To be fair to Sheard he doesn't miss the mark throughout the entire album. "When We Party" with Snoop Dogg is an obvious mimicry of the P-Funk sound, but it's the kind of beat Calvin Broadus has always sounded good on. Biggie's lyrics are quite obviously recycled from "Going Back to Cali" but that just makes Snoop's appearance seem even more appropriate. It's the kind of collaboration you would have actually liked to see back when he was still alive. It could have helped put an end to a lot of unnecessary East coast/West coast beef. The danger though is that "The King & I" turns into a new version of the "Duets" album, simply rebranded as a Faith Evans album featuring snippets of her late husband. This is exacerbated on the second half of the album by one rap all-star cameo after another, whereas if they had been spaced out throughout the CD it might be less obvious. In order after Snoop's guest shot Busta Rhymes appears on "Somebody Knows," Sheek Louch and Styles P appear on "Take Me There," Lil' Kim appears on "Lovin' You For Life" and Jadakiss appears on "NYC." The latter could be called a "make good" for having the audacity to remake "Ten Crack Commandments," because the aforementioned DJ Premier shows up to provide the beat and the scratches. I like the song even though the studio quality of the Biggie bars doesn't match up to Jada's no matter how much Primo tried to clean it up. I've been somewhat blunt throughout this review and it would be a disservice to you to be any less so at the conclusion, so I have to tell you that this album is completely unnecessary. That doesn't make it "bad" per se. Evans is a talented singer, her late great husband remains an all time rap legend, and everybody involved in this project seems on the surface to have had good intentions. It's not a completely shameless cash grab, but it definitely raises the public profile for Evans in a way she hasn't seen for years, so it's a PUBLICITY grab whether accidental or intended. It is out of respect and affection for Faith Evans that I can give her a slightly reluctant pass on this one. If she did "The King & I Part Two" five years from now I wouldn't feel so generous. I hope she uses this to relaunch her solo career and return to her heights of old.